Glow There: The neon--and the broiler--keeps burning until 1am at OJ's. THE FIRST TIME I ate at Joe's was in 1971. I had just transferred to San Jose State. The war was on. My bike had just been stolen. One day I took a walk downtown and found myself gazing into a window on First, where a man ate steak and eggs. He sat in a stool tilted back at the counter, reading a newspaper with one hand, eating with the other. It made me so hungry that I walked in, sat at the counter and had one of Joe's burgers--one of the biggest I'd ever seen--served plain on a toasted roll with crushed onions. And fries too, crispy and thick. The Hamburger Sandwich ($8.50) and the fries have not changed. There were times I had nothing good to say about Joe's. Nouvelle cuisine put a nine-year hex on me. Under its spell, I actually harbored a grudge against OJ's Bolognese-style meat sauce. I complained it was too thick, had no flavor--basic diner grade. One day, I toured the kitchen and was directed to a kettle steaming profusely with a fragrant morning batch. Though I've come to appreciate it now, I wasn't convinced then. Like everybody else, sooner or later I ended up at Joe's. It was like a beacon late at night. In those days, we'd arrive around 12:30am, get a booth, talk, have beers, pick at an antipasto ($7.50 for one; $12.95 large) of ham and cheese and beefsteak tomatoes dressed with wine vinegar and oil. With it came fresh bread, delivered by real city waiters--all of them quirky, all of them in tuxedoes. The bread still keeps coming--almost to a fault--and those waiters. When these guys, and the chefs on the line, shift into high gear, watch out. Not often, but sometimes, I get in for a late breakfast--when Joe's opens, at 11am--of ham and eggs ($10.95). Or a Joe's Special ($9.95): eggs scrambled with spinach and ground beef--a dish invented in North Beach around 1932 by bandleader Fortune Nelson "Bunny" Burson. There are items on the menu I still won't order, like the Veal Parmigiana ($18.95). Most people like it. I can't make sense out of the melted cheese. On the other hand, I love the Osso Bucco--braised veal shanks with marrow in the bones, soaked and succulent in pan gravy. Joe's recipe puts some I had in Milan to shame. They used to offer it twice a week, now just on Wednesdays for $13.95--and only at lunch. I've never had a bad steak at Joe's. My favorite is the 16-ounce Filet Mignon ($32.95) broiled over charcoal and served with a lemon wedge for seasoning. The night I came with Reverend Ryan and the Pelican, we sampled all three steaks, Filet, Rib ($25.95) with bone, and an 18-ounce New York ($25.95). We had them with baked potatoes and a plate of sautéed spinach (not listed on the menu) with bacon and mushrooms. When not in the mood for red meat, I order two skinless chicken breasts ($13.95 for two; $15.95 for three), broiled a little crisp on the top. Once in a great while, I dig into a plate of Veal Scaloppini ($18.95) like I did with friends on the last visit. We all took swipes at the fresh gravy laced heavily with wine. When I have it, I prefer to sit at the counter where I can watch the chefs. They practice an extreme form of flip-frying that produces hissing flashes of fire and aromas that hang in the air. Mainly, I come to Joe's to hide out at slack tide between lunch and dinner. I sit at the bar, write notes, talk to people. I've heard stories that defy description. I've gotten tips on stocks. I met a professor from Stanford, Bob, who came in every day, telling stories about German submarines. 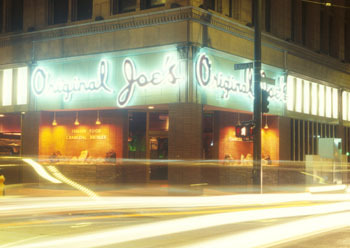 You don't have to like the food to like Original Joe's. It's the best show in town. Address: 301 S. First St.
From the November 22-28, 2001 issue of Metro, Silicon Valley's Weekly Newspaper. Copyright © 2001 Metro Publishing Inc. Metroactive is affiliated with the Boulevards Network.